Time series data is proving to be very useful these days in a number of different industries. However, fitting a specific model is not always a straightforward process. It requires a good look at the series in question, and possibly trying several different models before identifying the best one. So how do we get there? In this post, I'll take a look at how we can examine our data and get a feel for what models might work in a particular case. 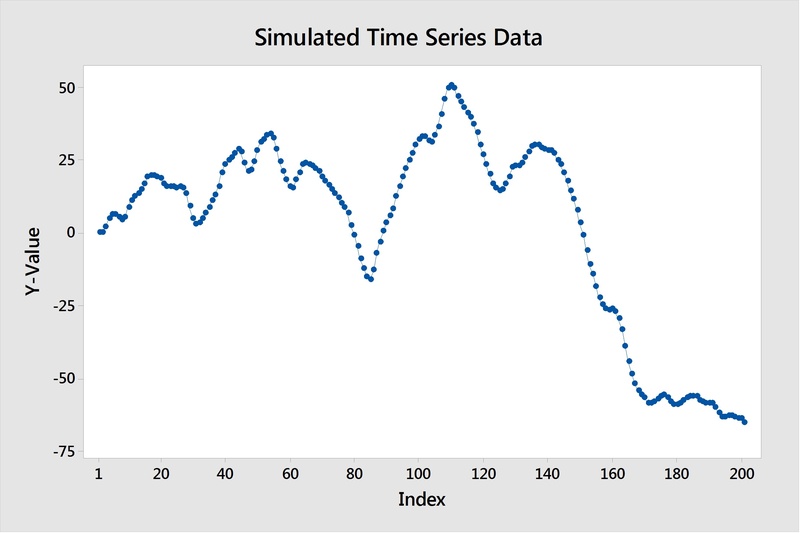 How Does a Time Series Work? The first thing to note is how Time Series work in general, and how those concepts apply to fitting the ARIMA model we're going to create. 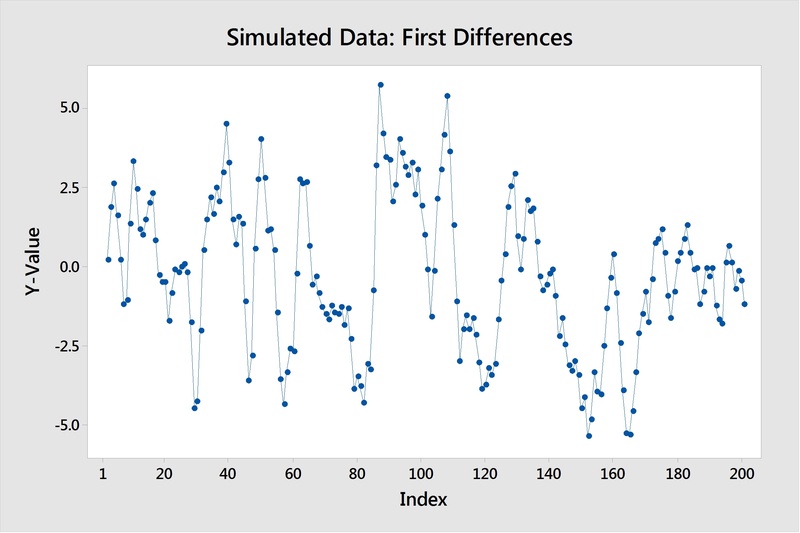 In general, there are two things we look at when trying to fit a time series model. One is past values, which is what we use in AR (autoregressive) models. Essentially, we predict what our next point would be based on looking at a certain number of past points. An AR(1) model would forecast future values by looking at 1 past value. The second thing we can look at is past prediction errors. These are called MA (moving average) models, and an MA(1) model would be predicting future values using 1 past prediction error. Both of these concepts make sense individually; they're just different approaches to how we predict future points. An ARIMA model uses both of these ideas and allows us to fit one nice model that looks at both past values and past prediction errors. Here are some things to look for. First, a key assumption with these models is that our series has to be stationary. A stationary time series is one whose mean and variance are constant over time. In our case, it's clear that our mean is not constant over time—it's decreasing. It took one difference to make our data stationary, so we now have one piece of our ARIMA model, the "I", which stands for "Integration." We know that we have an ARIMA(p,1,q). Now, how do we find the AR term(p) and the MA term(q)? To do that, we need to dive into two plots, namely the ACF and PACF—and this is where it gets tricky. The ACF stands for Autocorrelation function, and the PACF for Partial Autocorrelation function. Looking at these two plots together can help us form an idea of what models to fit. 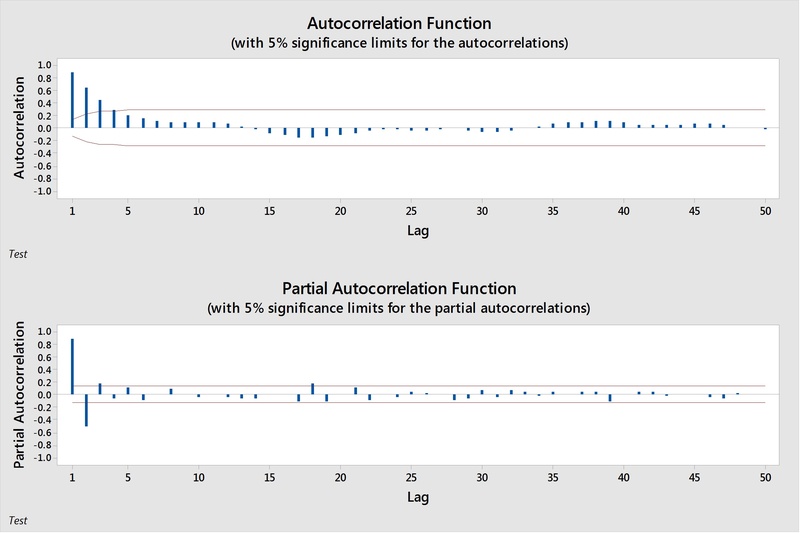 Autocorrelation computes and plots the autocorrelations of a time series. Autocorrelation is the correlation between observations of a time series separated by k time units. So what do these plots tell us? They each show a clear pattern, but how does that pattern help us to determine what our p and q values will be? Let's notice our patterns. Our PACF slowly tapers to 0, although it has two spikes at lags 1 and 2. On the other side, our ACF shows a tapering pattern, with lags slowly degrading towards 0. The table below can be used to help identify patterns, and what model conclusions we can make about those patterns. Values that remain close to 1, no tapering off Values that remain close to 1, no tapering off Symptoms of a non-stationary series. Differencing is most likely needed. If a model contains both AR and MA terms, the interpretation gets trickier. In general, both will taper off to 0. There may still be spikes in the ACF and/or PACF which could lead you to try AR and MA terms of that quantity. However, it usually helps to try a few different models, and based on model diagnostics, choose which one fits best. In this case, I used simulated data, so I know the best fit for my model is going to be an ARIMA(1,1,1). However, with real-world data, the answer may not be so obvious, and thus many models may have to be considered before landing on a single choice. In my next post, I'll go over some diagnostic measures we can compare between models to see which gives us the best fit.